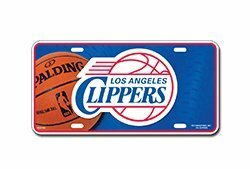 This is a BRAND NEW Beautiful Officially Licensed Metal License Plate to show your support of your favorite team! A Must-Have for the TRUE fan! Product Features · Product is metal · Standard 6" x 12" · Beautiful coloring! · Officially licensed Great for the Car, Truck, SUV, Van, Office Wall or Gameroom!! If you have any questions about this product by www.FanNut.com, contact us by completing and submitting the form below. If you are looking for a specif part number, please include it with your message.